Most times of the year, the Oregon Coast is windy, rainy and cold. But in summertime you can get lucky with mild winds and sunny days. Some days it’s even nice enough to wear a t-shirt! On days when it’s still a little more windy, most people are fine with just a hat and a sweatshirt and long pants. When you’re driving to the Oregon Coast from most inland cities along the I-5 corridor, it’s only an hour or two away. All along the coast are many pull-outs to stop for views and photo taking, eateries, and quaint little towns, some with more to offer than others. From Eugene, the towns of Florence, Yachats, and Newport are well within reach. Whale watching is one of the prime reasons that people visit the Oregon Coast. Gray whales are visible from Oregon’s shore nearly year-round, but two weeks every year in December and March, a visitor’s chances of seeing whales are much greater. During the winter and spring Whale Watch Weeks along the Oregon Coast, about 20,000 gray whales migrate along Oregon’s shores, either moving north from Mexico where their babies are born, or moving down to Mexico to their winter feeding grounds. 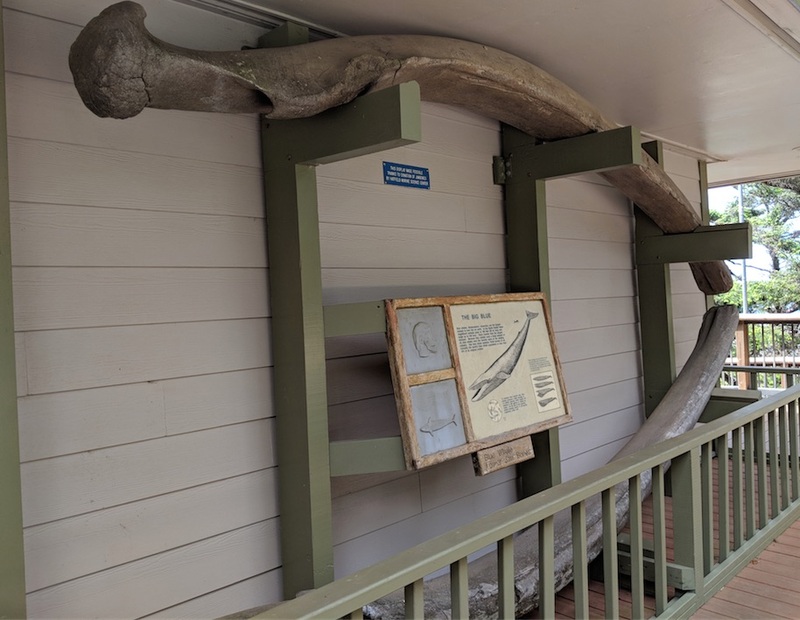 A blue whale lower jaw bone is on display at the Cape Perpetua Visitor’s Center. During Whale Watch Week, volunteers set up stations along the coast. They can provide some binoculars if you don’t have your own, and tips on how to spot whales and where to look for them. In spring and fall, grey whales make their migration between the warm water in Mexico where they have their babies in the summertime and the northern waters where they live the rest of the year. Depoe Bay, just north of Newport, is well-known as a place where it is possible to see whales all year-round. This is because some whales choose to stay in Depoe Bay all year-round thanks to the abundant food supply they can find there. Learn more about Whale Watching Week at the Whale Watching Spoken Here site. 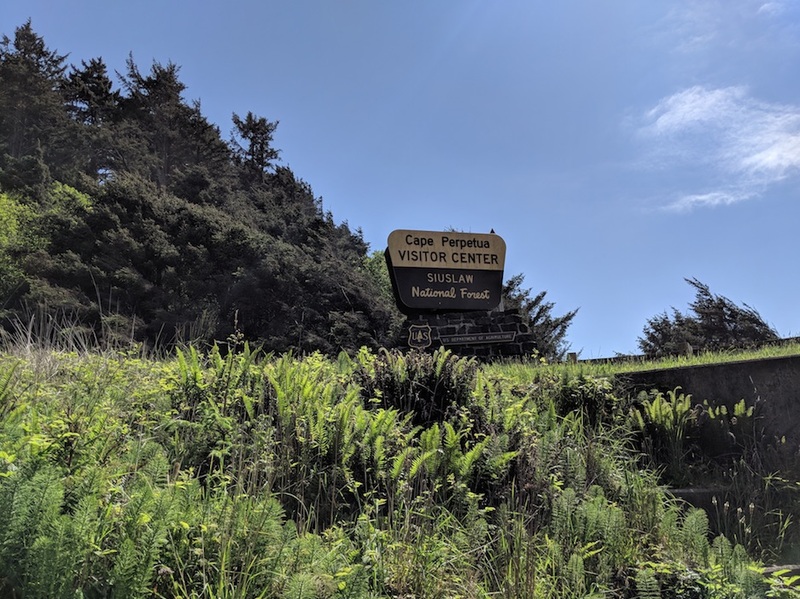 One of our favorite whale watching and ocean viewing sites is Cape Perpetua Visitors Center. We love this spot because the visitor’s center has a large, sheltered inside area with a 180-degree viewing window and a wheelchair accessible deck. The center is open seven days a week most of the year, with staff that can answer questions and help you plan the rest of your Oregon Coast trip. Parking is $5, but it’s more than worth it to be in an indoor place with bathrooms in case the weather really turns. The view from Cape Perpetua Visitor’s Center. As you can see in the photo above, my son would rather read than watch the ocean! 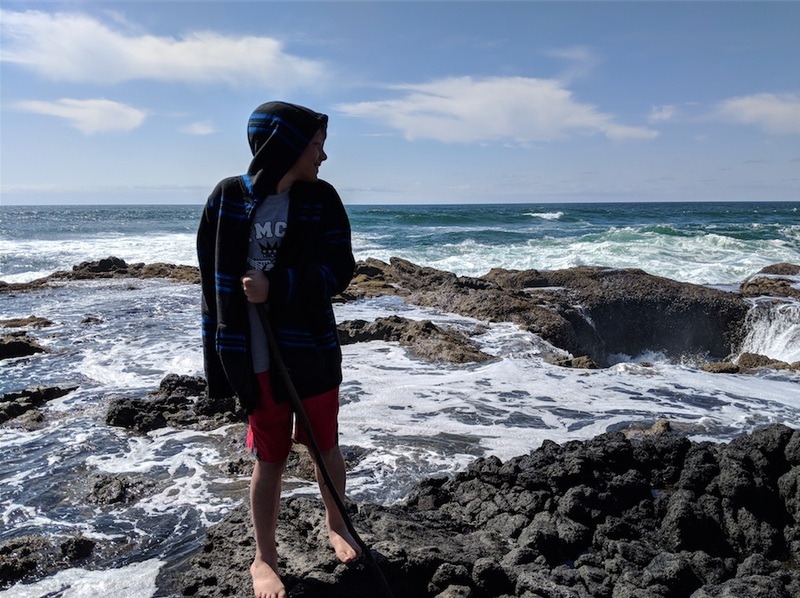 Even if there are no whales to be seen, Cape Perpetua has sheltered spots for cozy reading, picnic tables, and an easy (but not wheelchair accessible) path to the ocean. From the Cape Perpetua Visitors Center there are 26 miles of trails, many of which start at the Visitors Center. One of the trails heads to a nearby campground and passes through old-growth forests. 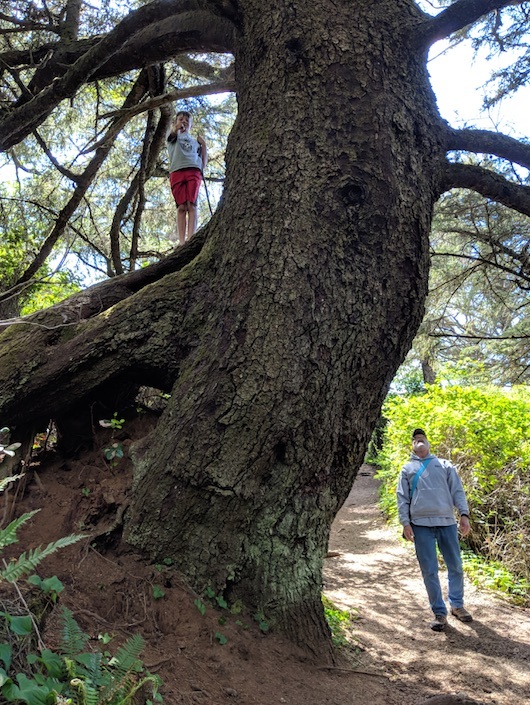 The Cape Perpetua trail systems travels among old-growth trees like this one. 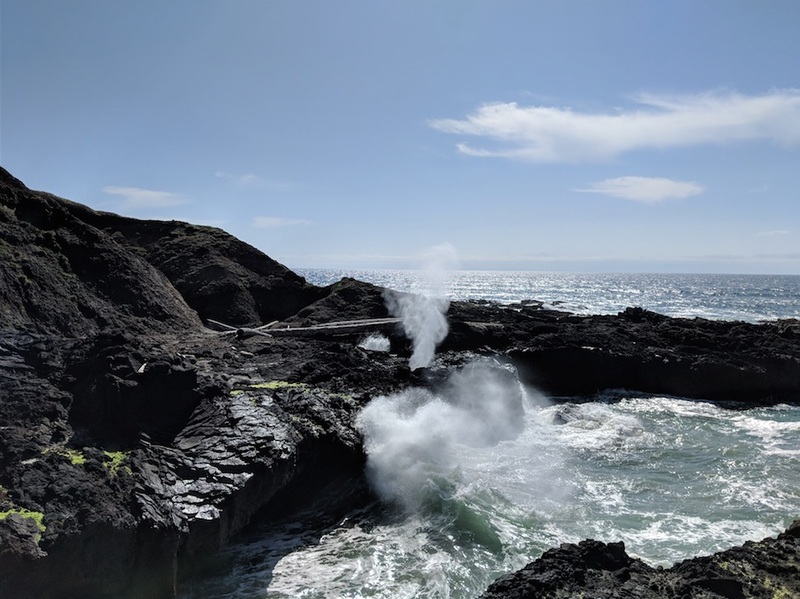 Other trails head to the coast including walks through tidepools and stunning views of Devil’s Churn, a feature where as the tide comes in it can throw spray several hundred feet into the air when the waves pass through the churn. Devil’s Churn is a dramatic spot where incoming tides push water dozens of feet high through a rocky spout. The trails are paved but are steep in some spots. They empty out in several places along the shore, where you can spread out and check for tidepools, and watch the ocean’s drama. When you make it down to the shore, be careful. this can be a dangerous spot as the rocky, steep inlets push water high up over the edges where people can stand. The Siuslaw National Forest is a spot where steep wooded hillsides give way to scrubby brush and finally a dramatic rocky beach. 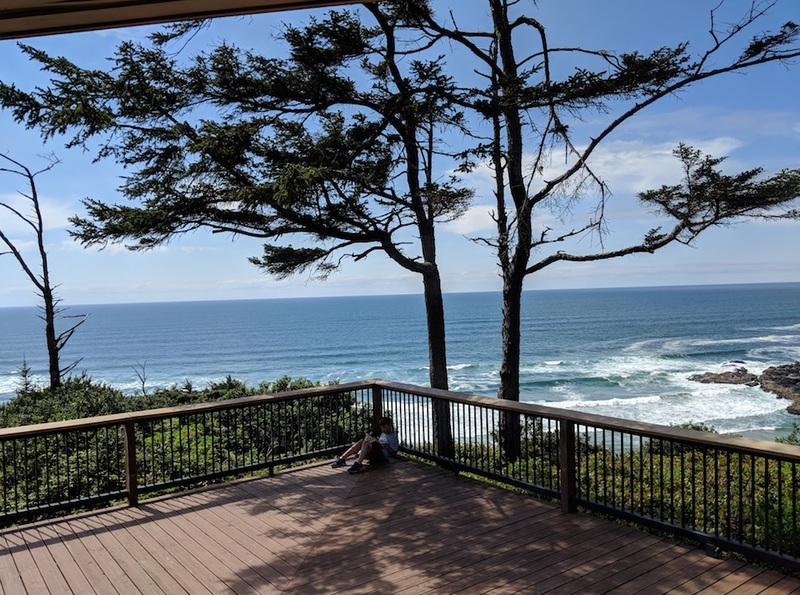 If an Oregon Coast day trip is not in the cards for you and you would like to stay overnight, use this search box to find hotels near Yachats, Oregon, a quaint little town very near everything that was mentioned in this article. Vanessa Salvia is a traveler and journalist based in Oregon.